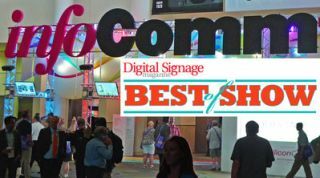 The InfoComm Best of Show– Digital Signage Awards, are open for entry. If your company will have a booth at the InfoComm show in June (this is required to enter) and you want to enter your Digital Signage product for the “Best of Show Award” program, click the link below, fill out the form, and be sure to select “Best of Show: Digital Signage”. This is important– to be considered by our team of Digital Signage judges/experts on site, and win a "Best of Show Digital Signage" award, you must check "Best of Show: Digital Signage" on the entry form. The winners of Awards will be announced on-site the last day of the InfoComm Show in Las Vegas in June. And note, all entrants will have their new product or products highlighted in a special post-InfoComm eZine delivered to the entire industry.